While reading a book entitled "Several Short Sentences About Writing," the author suggested something that had never occurred to me. I stuck my finger between the pages to mark my place and pulled out a sticky note to jot down a reminder - "Video some of my columns." He suggests that reading your work out loud will help refine your writing voice and make you use better words. The end result is your work become easier for readers to read. A few weeks ago a colleague suggested a blog she thought I might like. Sean of the South. Like me, Sean is a columnist who has written several books. His work blew me away. His blogs/columns are conversational, but he manages to put emotion into his words. He also does videos of him reading his stories. After reading his columns and watching a few of his videos, I decided to try doing a video of my column that ran in the Sunday paper today. It took a few hours to record 500 words. While reading it aloud, I found several places where the words felt wonky. The rhythm seemed off. I knew right then and there that this exercise would benefit me in a lot of ways. Hopefully, it will help me get better. 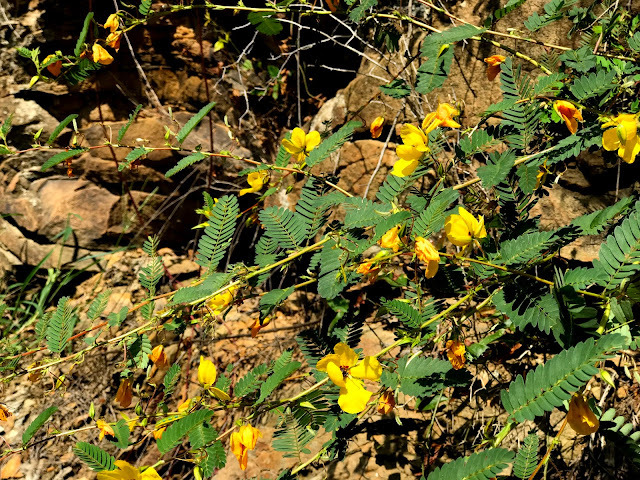 This picture is one of some yellow flowers growing among rocks on the roadside. It has nothing to do with the entry tonight, but I like the way the light fell on the scene. I should try this on my other site. I bet I will discover similar writing awkwardness. Reading aloud often shows up weaknesses. A video is a step too far for my camera averse self though. Sean does write beautifully. He add just enough of the interesting descriptions that peak our interest and doesn't distract from his story. His stories are smooth as silk. It's always good to try and better yourself. Doing something new definitely can put a new light on things. The video thing is an interesting idea. I wonder how I will do. I do tend to have long run on sentences at times. I hate the way my voice sounds, I'm sure I wouldn't like the way my writing sounds. I love the way you write NOW!! But of course reading to the camera would be a great idea. I hope this works out and brings you an even larger audience. I sound like "Tiny Tim" from "A Christmas Carol" so I won't be doing anything similar.